There are two type of fixed income mutual funds: taxable bond and municipal bond. 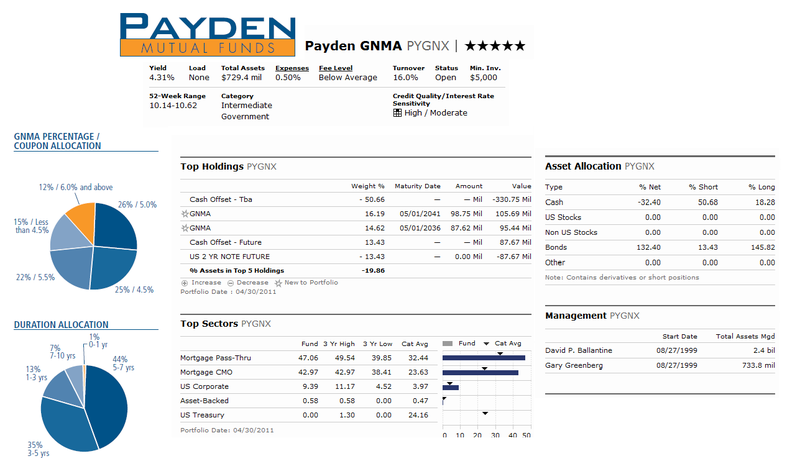 The following article will present one of the best taxable bond funds, Payden GNMA fund. Details fund's review can be found below. The Payden GNMA Fund's objective is to provide a high level of total return that is consistent with preservation of capital. The fund generally invests most of total assets (>80%) in government National Mortgage Association mortgage-backed securities. This GNMA bonds are debt securities representing part ownership in a pool of mortgage loans backed by the U.S. government. This Payden GNMA fund invests in debt securities of any maturity, and there is no limit on the fund's maximum average portfolio maturity. This bond fund is considered as a non-diversified investment fund. Gerry Greenberg and David P. Ballantine have managed this PYGNX fund since its inception in August 1999. David Ballantine is the principal fund manager of this Payden & Rygel fund. This taxable bond fund has an annual expense ratio of 0.50%. This expense fee is comparable to the average expense fee in the Intermediate Government category which is 0.99%. There is no 12b1 fee and no front-end sales load fee for this fund. This best rated fund also has a dividend yield of 4.37% over the past 12 months. This Payden Fund has gotten 5-stars rating from Morningstar. It is also listed as the best government bond fund in US News. The performance of this top fund since its inception was always returned in positive figure for the consecutive 11 years. The highest achievement was in year 2000 with 11.22 and the lowest was in year 2005 with 2.96%. This fund has returned 4.70% over the past 1 year and 5.89% over the past decade. This dividend is paid monthly. Currently the YTD return of this PYGNX fund is 3.48%. Investor may invest in this fund using brokerage account or retirement account (IRA, 401k). To invest in the brokerage account, you will need $5,000 initial investment balance and $2,000 for IRA account. For subsequent investment, you only need $250 or more to add any new funding to your account, for either brokerage or IRA account. Investor can purchase this Payden fund from 74 brokerages include JP Morgan, Schwab Retail, Ameriprise Brokerage, ETrade No Load Fee, Td Ameritrade, E Trade Financial, Vanguard NTF, Firstrade, Robert W. Baird & Co, Bear Stearns, etc. The other class of this best fund is Adviser Class (PYGWX). The dividend for the last 12 months is $0.440 and it also has an expense ratio of 0.75%. The top sectors of this PYGNX fund as of April 2011 are Mortgage Pass-Thru (47.06%), Mortgage CMO (42.97%), US Corporate (9.39%) and Asset-Backed (0.58%).